Start the program. The main window will be displayed. 1) Add the folder(s) that will be scanned using "Add Folder" button (1) or drag and drop them inside the application from Windows Explorer. Note: Folders can be excluded from "Auto-check" and "Self scan" using the checkboxes in front of the folder name. Reference the help file for more details. 3) Select "Visual Compare" method from the drop down list (3). Note: "CRC32 Checksum" method does not scan images for visual similarity. Using this method only 100% binary equal images can be found. "File Size" method will find duplicates with equal file sizes. 4) Adjust the "Similarity" spin button to the desired value (4). The default similarity value is 95%. It is finely tweaked and produces the best results for common images. Note: The similarity value is used only if the selected method is "Visual Compare". 5) Select "<New Cache>" from "Cache" drop down list (5) or an existing cache if one has previously been created. Note: Using cache files extremely speeds up the the scan for consecutive scans. Even if the files are modified they will be detected and updated in the cache. 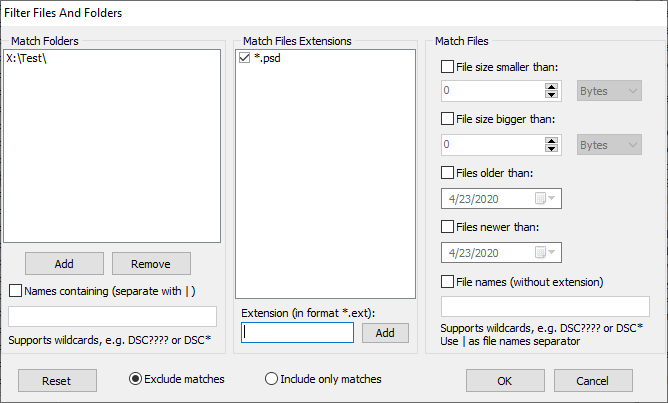 The settings applied in the example will exclude files located in the folders listed inside the "Match folders" list, files having PSD extension and files smaller than 500 bytes. Duplicate image files are grouped together with alternating group colors. Depending on the "Auto Check" settings, the program can automatically check the smaller images in every duplicate group. If some files are un/checked manually, the "Auto Check " button (1) can be used to reset the selection. The "Quick Check" tool button (2) to check the images by various criteria. 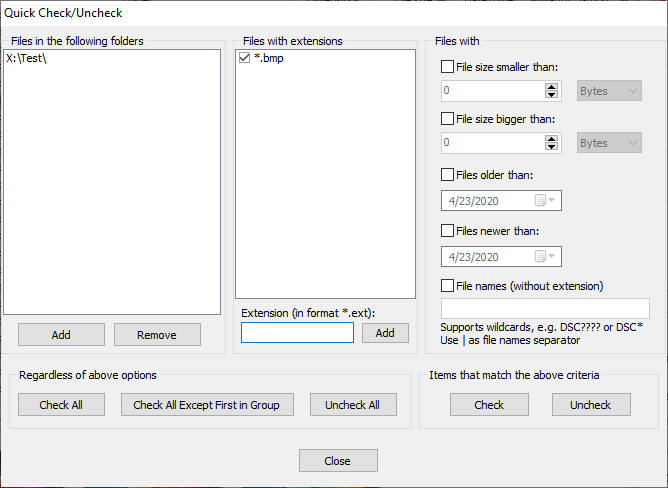 By using "Quick Check" and the settings in the above dialog all BMP images located in the folders listed in the "Files in the following folders" and smaller than 100 bytes will be checked. After checking the files to be moved, copied or deleted (3) using the "Perform" button will execute the selected action. Checked files can be deleted to the Recycle Bin by selecting the "Delete checked files to Recycle Bin" option. Checked files can be moved/copied to a custom folder by selecting "Move checked files"/"Copy checked files" options and specifying a destination folder. Source folder structure will be recreated in the target folder if "Keep folder structure" option is checked, otherwise all duplicates will be moved to the root of the destination folder. The duplicates list supports multiple selection. Multiple files can be selected using the mouse and Ctrl/Shift keys. Note the difference between checked and selected files. The selected files can be removed from the list using Delete key and deleted from the hard drive using the Shift+Delete key.